Chun Hui Pak participated in the Under the Influence show in Fall 2016 at Village West. "I'm Chun Hui Pak, and I have a studio in Austin, Texas. I came from Korea and lived for many years in Michigan. I taught art at the university level in Illinois, Michigan and Texas along with volunteer work in several art societies and for the Detroit Institute of Art's Asian Art review committee. I have a BFA from the School of Art Institute in Chicago and a MFA from the Yale School of Art. My artwork is currently represented in Austin by Davis Gallery. 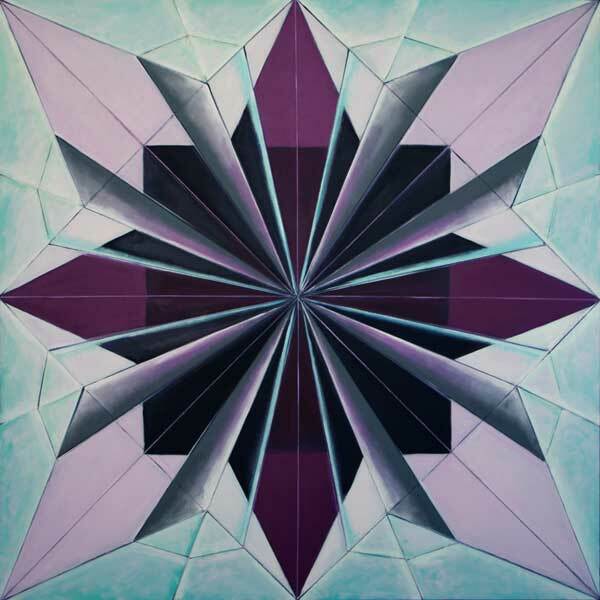 My twin passions are oil painting and the study of origami folds, which I interpret in the geometry of my paintings. Inspired by Georgia O'Keeffe's seminal Black Iris abstract painting - and particularly her interest in essential structure and form of the flower. I created a body of work over the years that interprets and projects the Origami Iris Flower Fold as a number of large abstract oil paintings. The interpretations are planar shapes, colors, textures and shadows that push and pull the painted surfaces offering the illusion of three-dimensional sculpted reliefs. When I study a folded shape - the classic Iris Flower Fold for example - I discover complexities in the underlying structure that are grounded in Asian concepts of Yin and Yang: two contrary but simultaneously synergistic philosophical principles in which all things, beings, events and time continuums are ordered. This process of making art is also a means of meditation for the artist. Within each artwork are grids and structural mechanisms I employ as conceptual processes which fuel my intuition and visualization of colors, shapes and textures that coincide to generate artworks with a sense of mystery, mood, or even whimsy. Viewers of my paintings may experience the Zen-like State of both calm and tempest as the rippling, pulsating surfaces create spatial dynamics and rhythms." For more information, please visit chunhuipakart.com.